I’ve been on a Caribbean food kick for the past few weeks. This dish is similar to “The Hash” I make for breakfast. They’re great on their own or served with these meatballs. This will serve 4. Chop and boil potatoes for 6-8 min (they still need to be firm). Drain the potatoes and heat enough vegetable oil to cover the bottom of a large frying pan. 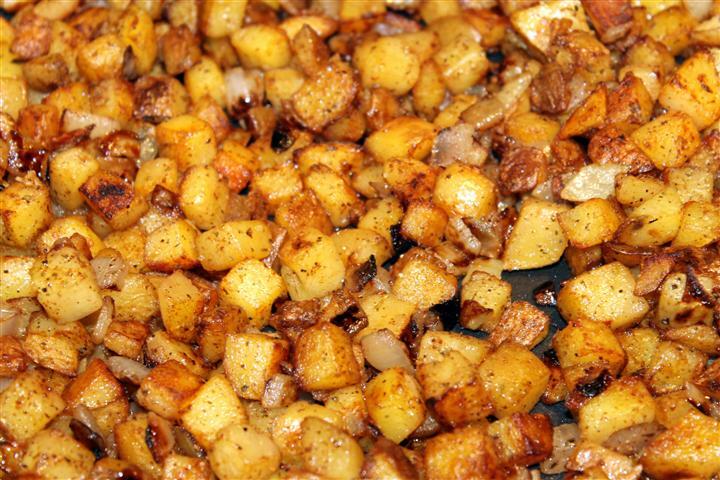 Fry potatoes for 15 minutes, turning occasionally until they start to turn golden brown. Grind the all spice, cloves, thyme, cinnamon, and ginger together in a spice grinder. Add onions and spice mixture to potatoes, continue to cook for another 15 minutes or until crispy (I like a slight amount of char on the onions). Add salt, pepper, and cayenne to taste. Do you boil your potatoes first to cut down on saute time? I usually just saute mine raw, but it takes forever! I’m also going to try your suggestion of adding the onions after the potatoes have been in a while. I have been sauteing onions and peppers first, then adding potatoes, but I find that sometimes the onions often get too done that way. ¡Buen ideas, Señor Gringo! OK, just found my answer in your other hash post about using par-boiled potatoes to cut down on saute time. Gracias! De nada! If you par-boil them you can often get a crispier potato. It really depends on the texture you’re going for and the time-frame you have. Thanks for stopping by!